Rahul Dravid has been retained as captain for the forthcoming ODI and Test squads for the upcoming tour of Ireland and England while Mahender Singh Dhoni has been elevated as vice-captain for the ODI series. Sachin Tendulkar takes the deputy’s job for the three-Test series against England. An extended poor patch finally cost Virender Shewag (right) his place in the 15-member ODI squad while dashing wicketkeeper Mahendra Singh Dhoni was made the vice-captain for the first time for the upcoming ODI series. Despite his unbeaten 139 in the third match of the Afro-Asia Cup in Chennai, Indian wicketkeeper- batsman Mahendra Singh Dhoni remained in the fourth place in the latest LG ICC Player Rankings for ODI batsmen. The four-day batsmen’s fitness camp ended here today without the presence of Team India skipper Rahul Dravid and middle-order batsman Mohammed Kaif. Dravid missed the final day’s session, featuring fielding drills and a brief stint at the nets, as he had to attend the selection committee meeting in Delhi to choose the Indian squad for the tours of Ireland and England. The Indian cricketers today had their way on the contentious contracts issue, forcing the BCCI to go back to the graded system under which the top five players get a retainership of Rs 50 lakh each annually. Monty Panesar has said keeping his emotions under control is proving one of the biggest challenges of his soaring Test cricket career. Unseeded Sania Mirza carved out a fine 6-3, 6-3 victory against Maria Elena Camerin of Italy in the first round of the $200,000 DFS Classic tennis tournament in Birmingham. Sania did not have an ideal start to her first match on grass after playing on Roland Garros clay in Paris as she trailed 1-3 in the first set against the world number 66 in the tier III event yesterday. India has been drawn with arch-rivals Pakistan and minnows Scotland for the group stages of the inaugural Twenty20 World Cup to be held in South Africa in September. India’s Ronjan Singh Sondhi missed the podium finish by one point while his fancied compatriot Rajyavardhan Singh Rathore failed even to make it to the final of the men’s double trap event at the ISSF World Cup in Lonato, Italy, yesterday. The family members of former cricketer Subhash Dixit, who committed suicide on Saturday, are set to receive financial assistance from various quarters. 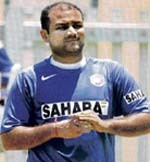 Meanwhile, Virender Sehwag, Harbhajan Singh and an injured Munaf Patel were axed from both the ODI and Test squads. Veterans Sachin Tendulkar and Sourav Ganguly, who were rested for the one-day series in Bangladesh last month, were included in the 15-member ODI squad. Announcing the teams here today after the selection committee meeting, Board of Control for Cricket in India (BCCI) secretary Niranjan Shah and chairman of the selection committee Dilip Vengsarkar said the “players have been picked on the basis of the requirement of the Test and ODI teams.. Regarding Dhoni’s elevation to ODI vice-captaincy, Vengsarkar said he was “a fine player and a thinking cricketer who needed to be promoted”. He said Dinesh Karthik was picked for both the longer and shorter version of cricket both as a batsman and a wicket-keeper as he had done “extremely well as an opening bat” and it was imperative to send two-wicket keepers on foreign tours. Vengsarkar said the appointment of former captain Sachin Tendulkar as vice-captain for the Test series against England was on account of his “experience”. He said Zaheer Khan was “hundred per cent fit” and hence his selection while Harbhajan would have to bowl well and take wickets to return to the India team. The team for the seven ODIs against England would be announced later. Ajit Agarkar got a ODI recall replacing injured Munaf Patel. “Munaf is not 100 per cent fit and that’s why he missed out,” Vengsarkar said. Mumbai batsman Rohit Sharma is the lone new face in the squad. Meanwhile, Bengal pacer Ranadeb Bose replaced VRV Singh in the squad for the three-match Test series against England, while Delhi pacer Ishant Sharma retaied his place. Vengsarkar said Bose was rewarded with a berth for his impressive form in domestic cricket last year when he emerged as the highest wicket-taker. “Besides, conditions in England would be conducive to his bowling,” Vengsarkar said. India will play three one dayers against South Africa in Ireland between June 26-July 1, followed by a one-off ODI against Pakistan in Glasgow, Scotland on July 3. They then move to England for a full series of three Test and seven ODIs between July 19-September 8. After the England series, Australia would be visiting India to play seven ODIs from September 29 to October 21 while Pakistan will arrive in India on November 2 to play five ODIs and three Test matches. The 15-member squad for Ireland and Scotland ODIs: Rahul Dravid (Captain), MS Dhoni (Vice Captain), Gautam Gambhir, Sourav Ganguly, Sachin Tendulkar, Yuvraj Singh, Dinesh Kaarthick, Zaheer Khan, S Sreesanth, Rudra Pratap Singh, Ajit Agarkar, Piyush Chawla, Ramesh Powar, Robin Uthappa and Rohit Sharma. The 16-member squad for three Tests against England: Rahul Dravid (Captain), Sachin Tendulkar (Vice Captain), Wasim Jaffer, Dinesh Kaarthick, Sourav Ganguly, VVS Laxman, Yuvraj Singh, MS Dhoni, Zaheer Khan, S Sreesanth, Rudra Pratap Singh, Anil Kumble, Ramesh Powar, Gautam Gambhir, Ishant Sharma and Ranadeb Bose. Dhoni, who hit the highest-ever ODI score by a number seven batsman in the Chennai match, now trails third-placed Michael Hussey of Australia by 10 rating points. England’s Kevin Pietersen still occupies the top batting spot, with Australia captain Ricky Ponting in second place. Sri Lanka opening batsman Sanath Jayasuriya’s slide in the rankings since the World Cup continues as he has dropped six places and is now ranked 13th overall. Jayasuriya’s loss means Australia’s Andrew Symonds has moved into the top 10. South Africa’s Shaun Pollock has achieved his highest career batting rating following his maiden ODI century in the Afro-Asia Cup match in Bangalore last week. Pollock moves up 12 places and is now in 40th spot in the batsmen’s rankings after a brilliant 130 off 110 balls. The four-day batsmen’s fitness camp ended here today without the presence of Team India skipper Rahul Dravid and middle-order batsman Mohammed Kaif. Dravid missed the final day’s session, featuring fielding drills and a brief stint at the nets, as he had to attend the selection committee meeting in Delhi to choose the Indian squad for the tours of Ireland and England. Kaif missed the morning session and was scheduled to make an appearance in the afternoon but skipped that too. Bowling coach Venkatesh Prasad said the four-day programme preceded by the bowlers’ camp at Mysore from June 4-8 was a continuation of the process set in motion by Greg Chappell during his stint as the national coach. “We wanted to keep the players going soon after the Bangladesh tour, which was tough because of the heat and humidity. I know it was tough on the players but we wanted to continue the concept Greg had introduced,” said the former India pacer. 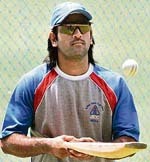 “The camps were held because of the long schedule for the Indian team during which players can get injured. When someone is called (as replacement for the injured player) he should be ready (for the challenges),” Prasad said. “These camps were basically for (improving) fitness but me and (fielding coach) Robin Singh wanted to break the monotony and introduced batting and bowling sessions too, but briefly,” he said. The graded system had been abolished after the team’s disastrous performance in the World Cup and replaced by a combination of match fees and bonuses. The board had also capped players’ endorsements. Faced with stiff resistance by the top players such as skipper Rahul Dravid, Sachin Tendulkar, Anil Kumble and Sourav Ganguly, the board’s working committee backed off and chose to revert to the system under which the top 15 players are graded A, B, and C.
The committee, which met here with Dravid being present, decided to have the graded system till September this year. The ‘B’ and ‘C’ category players get Rs 35 lakh and Rs 20 lakh each per annum. The decision is a major climbdown for the board which cracked the whip on the players in the wake of World Cup debacle by restricting the number of products they could endorse to three and introducing a performance-based pay system. The contracts, due from October 1 last year, could not be signed before the team went for the World Cup in early March. Meanwhile, the BCCI extended the contracts of bowling and fielding coaches, Venkatesh Prasad and Robin Singh, for one year. Srinivasan refused to take questions about the launch of Indian Cricket League by Zee Television. But after repeated queries on the subject, asked if the Committee had given permission for Zee to go ahead with their plans, he said, “no”. Incidentally, Board sources said that no show cause notice would be issued to Kapil Dev and Kiran More, who have been appointed on the Board of directors of the ICL. Dubai: Monty Panesar has shot up 14 places in the latest LG-ICC Player Rankings for Test bowlers following his 10-wicket haul in the third cricket Test against the West Indies at Old Trafford. The 25-year-old left-arm spinner enhanced his growing reputation with 10 for 187 in England’s 60-run third Test win against the West Indies at Old Trafford. That saw Panesar become the first England spinner since Phil Tufnell against Australia at The Oval in 1997 to take 10 wickets in a Test match. 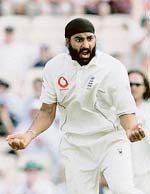 Off the field, Panesar, the first Sikh to play Test cricket for England, is as far removed in character from Tufnell as is possible to imagine, being a non-drinker and non-smoker, unlike the former Middlesex left-armer whose private life became the subject of some lurid newspaper headlines. But Panesar is as passionate as anyone when it comes to playing cricket and that enthusiasm, his manifest eagerness to do well, coupled with his undoubted skill has already made him a cult hero with fans around the world. Whereas Tufnell would sometimes turn his anger on team-mates if things weren’t going well, the only outlet Panesar has for his emotions on the cricket field appears to be with his frenzied appeals. As Shivnarine Chanderpaul, dropped on 18 by Panesar, slowly and methodically batted West Indies towards what would have been a Test record fourth innings victory total of 455, England’s spinner became increasingly frustrated as a succession of pleas were turned down by Pakistani umpire Aleem Dar. And at one point Panesar charged down the pitch to celebrate a ‘catch’ in the slips when a wickedly bouncing delivery had clipped Chanderpaul’s helmet. Players, who risk being fined or suspended if their conduct towards officials falls foul of the International Cricket Council code of conduct, are supposed to appeal to the umpire’s face before celebrating a wicket. Dar, after rejecting Panesar’s appeal, had a word with the bowler and appeared to be telling him to calm down. “He was saying maybe appeal before I start celebrating. I guess I get a little bit excited when I’m out there,” explained Panesar, whose sprint down the pitch when he takes a wicket gives the appearance of hyperactive puppet whose strings have just been cut. Panesar has been mocked for his poor fielding and now, in England at least, every time he successfully gathers and returns the ball spectators cheer him. However, yesterday, he surprised a few people by dismissing Darren Sammy caught and bowled following the all-rounder’s well-hit drive. Unseeded Sania Mirza carved out a fine 6-3, 6-3 victory against Maria Elena Camerin of Italy in the first round of the $200,000 DFS Classic tennis tournament in Birmingham. Sania did not have an ideal start to her first match on grass after playing on Roland Garros clay in Paris as she trailed 1-3 in the first set against the world number 66 in the tier III event yesterday. “You have to expect that, coming off clay and playing on a different surface,” said the Indian star after her one-hour, 28-minute contest. “It was my first match and it wasn’t one of the easier matches I could have got in the first round. She’s a seasoned player. I knew she was going to be tough and there’s always a little anxiety when you go on the court on a new surface for the first time,” she said. The world number 42 said she was satisfied that she played important points well. “Under the circumstances, I played an alright match. It’s not one of the better matches I’ve played but at the end of the day it’s how you play the important points and I think that’s what I did better,” she said. 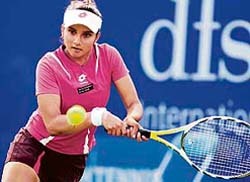 Sania also said she had completely recovered from the knee injury she was nursing for over three months. “I think that’s one of the reasons I was a little tight at the start of the match — thinking about my knee slightly. “It’s hard after three and a half months playing without tape and psychologically you don’t have the confidence to know how your knee is going to handle it and whether you’ll injure it again. Sania is next pitted against eight seed Mara Santangelo, also of Italy. “I’m playing a seed and she’s coming off a doubles win at the French Open,” she said. The three teams have been pooled in Group D of the tournament which will see 12 countries. Group A has South Africa, West Indies and Bangladesh while Group B features World Champions Australia, England and Zimbabwe. New Zealand, Sri Lanka and Kenya form Group C.
The teams were seeded based on their rankings as of the March 1, 2007. The group stages will be followed by the Super Eights, made up of the top two teams in each group. The semifinals will follow, CEO of South African cricket Gerald Majola said at a press conference today. Johannesburg, Cape Town and Durban have been chosen as the venues. The teams are expected to arrive approximately five-seven days before the first match. Two rounds of warm-up matches will be played on September 8 and 9. Low ticket prices at this year’s inaugural ICC Twenty20 World Cup are seen as the key to bringing crowds back to International Cricket Council events, according to Cricket South Africa chief Gerald Majola. “We’ve looked at the two previous ICC events - the World Cup in the Caribbean and the Champions Trophy in India - and in my opinion they were not successful,” Majola told reporters at the unveiling of the tournament logo in Johannesburg on Tuesday. To be hosted in South Africa from September 11-24, the Twenty20 World Cup will see 10 full members of the ICC and associate members Kenya and Scotland taking part. “To ensure that every person is able to enjoy the tournament, ticket prices will range from 20 to 160 rand ($1.40-$11.24),” Majola added. The 27 matches will be held in Johannesburg, Cape Town and Durban, with nine matches at each ground. Two double-headers each will be held in Cape Town and Durban, with one in Johannesburg, which will also host the final. Sondhi appeared to be in contention for a medal when he shot a superb 141 (48, 48, 45) to be just one point adrift of leader Joshua Richmond of the USA in the qualification round. But he could not raise his level in the final, where he managed 45 out of 50. Richmond won the gold medal and the Beijing Olympics quota place with a score of 191 (142+49). Vitaly Forkeev of Russia bagged the silver with 188 (140+48) and Daniele Dispigno of Italy claimed the bronze with 187 (139+48). Olympic silver medallist Rathore finished a distant 23rd with a score of 134 (44, 44, 46) and another Indian in the fray, Moraad Ali Khan, ended up 32nd. Moraad scored 132 after a disappointing third round of 41 following initial rounds of 44 and 47. The Uttar Pradesh Cricket Association has already announced a compensation of Rs 1 lakh. Popular TV comedian Raju Srivastava, a resident of Kanpur, visited Dixit’s house last evening and donated Rs 51,000. Regional sports officer Brijendra Kumar said he would send a proposal to the state government for providing assistance to the family of the deceased.